Send a Gift Certificate for Little Mama Products! 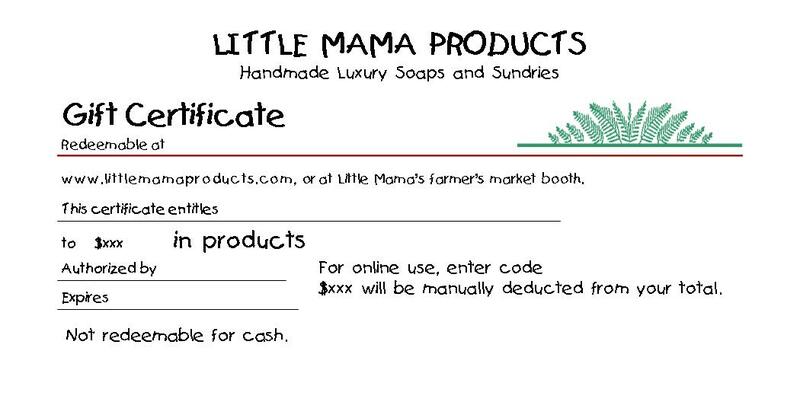 You purchase a Gift Certificate in an amount from $10 to $100, then your loved ones can spend it at Little Mama Products. YOU get to choose the amount to send, or spend! See the Gift Certificate FAQs for complete details. Treat your loved ones to a Gift Certificate for Little Mama's many products! Treat your loved ones to a Gift Certificate from Little Mama Products!